Crucial for IT service organizations, knowledge management allows teams and companies to collect and share information so everyone is on the same page. Without it, employees spend as much as 30% of their time looking up or recreating information that already exists, resulting in wasted time, frustrated customers, and higher operating costs. So how can you implement better knowledge management processes in your organization? Before we can drill down into knowledge management, we first need to understand the ITIL framework. The IT infrastructure library (ITIL) is neither a standard or methodology but rather a framework of adaptable best practices and non-prescriptive processes for IT service management (ITSM). Organizations use the ITIL as a flexible guide for creating and delivering IT services based on the specific needs and objectives of their industry, business, and customers. In other words, ITIL helps keep your IT services running smoothly and efficiently so your employees and customers are happy. The first stage of service management is establishing your overall strategy. During this phase, you will need to research and collect information on your business objectives, the needs of the end users, and the cost for both the business (service provider) and the customer. The goal of this phase is to identify and define the services your customers want and the services your organization can deliver. With a strategy in place, the next logical step is designing your service infrastructure. Make sure that all the processes, systems, tools, and resources are in place to support the services outlined in the strategy. In other words, during the service design stage, you will align the organization’s strategy with its practical implementation. 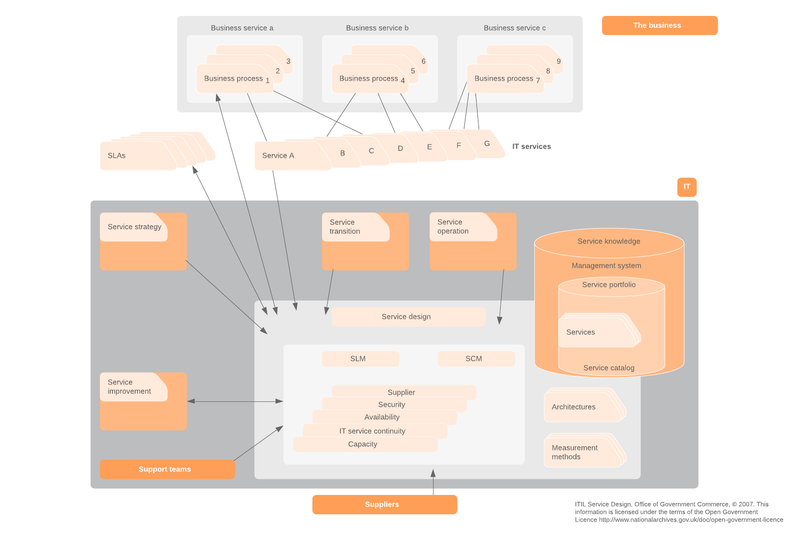 Service design requires working with your customers to define SLAs and commit to service level targets (SLTs) for availability, capacity, security, and continuity. This is the time to check and recheck all your processes and plans to ensure a smooth implementation and operation. 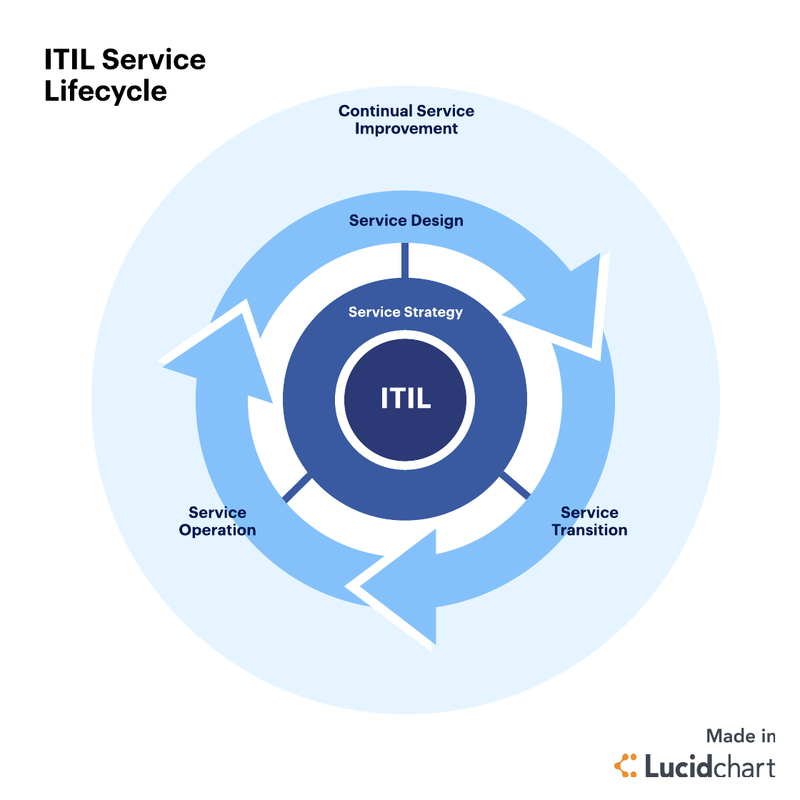 While ITIL provides a flexible framework for operation, it prescribes a structured process for managing and transitioning service changes so there is minimal impact on the business. Maintain the integrity of assets. Ensure the seamless implementation of services with repeatable processes for future transitions. Manage service knowledge assets, such as the service portfolio, configuration management database, and supplier contract database. By carefully managing the transition of services into live operation, IT managers can mitigate risks and reduce unexpected variations in delivery. With your strategy, design, and transition in place, you are finally ready to put those services into operation. Here, the ITIL outlines best practices and processes for delivering those agreed upon services through your service desk. Following clear processes will ensure issues are handled efficiently with the best possible outcomes. The final stage of the ITIL service lifecycle is tracking and measuring performance to identify areas for improvement. This is an ongoing process that increases efficiency, effectiveness, and customer satisfaction. What is ITIL knowledge management? Whether your organization follows a strict ITIL framework from strategy to operation or prefers to cherry-pick the processes that work best for them, you need knowledge base management in your IT service toolbox. 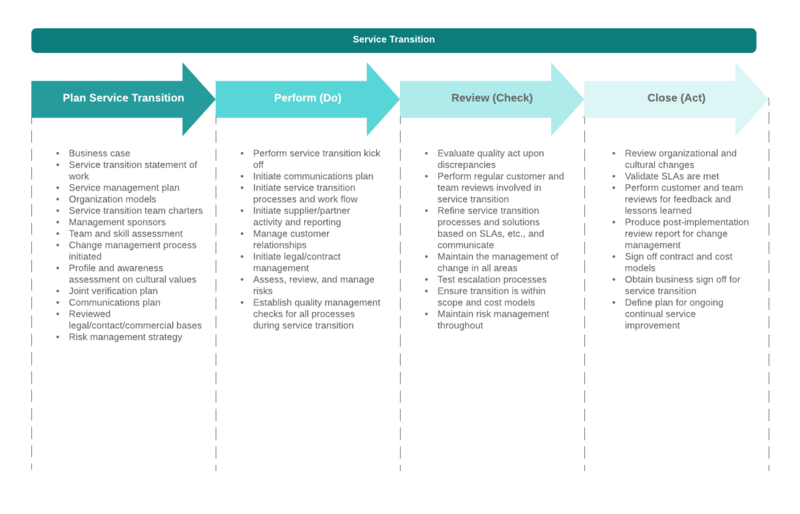 Knowledge management falls under the Service Transition stage of ITIL, but it touches each point of the service lifecycle in practice. Essentially, knowledge management allows you to collect, analyze, store, and share the total body of information within the organization, from strategy to improvement, under a service management knowledge system (SKSM). This knowledge includes not only processes and systems, but also staff skills, user behavior, organizational structure, and supplier information. In order to effectively implement services during the operation stage of the service lifecycle, teams will need access to different banks of data collected and documented in earlier phases. A clear knowledge management process ensures the efficient transfer of that information to the right people at the right time. The role of knowledge management is to improve decision making in your organization by making accurate and reliable information available throughout the service lifecycle. Improve employee training programs. When employees have access to your organization’s processes and best practices, they can hit the ground running and reduce hours spent in formal training meetings. Additionally, with one source of truth, you can rest assured your teams are working off the same assumptions and information, reducing time-consuming and frustrating inconsistencies. Reduce human errors and increase efficiency. Access to information and formal decision-making processes make it easy for employees to stay on track, avoid redundancies, and execute tasks with confidence. Scale customer support. When relevant parts of the SKSM are made available in a self-help user portal (or knowledge base), you can scale your customer support efforts so customers can find the answers they need and you can focus on solving bigger problems within the service desk to-do list. Increase customer satisfaction. Organizations that manage their knowledge base have happier customers because their employees are better trained, more knowledgeable, and more efficient and effective at delivering expected services. As useful as a knowledge base is, many organizations fail to successfully implement a knowledge management program. Challenges like insufficient training, lack of leadership buy-in, competitive cultures that lead to information hoarding, and unclear or ineffective processes for knowledge capture doom many programs to failure. There are four key enablers to knowledge management: culture, infrastructure, measures, and technology. Organizations need a culture of knowledge sharing with the infrastructure to support it through systems, teams, processes, and collaboration. Additionally, there needs to be a measure and strategy in place to collect, categorize, and manage information, with the technology to support those efforts. Lucidchart helps IT service teams and organizations identify, document, and track knowledge management processes through its dynamic diagramming platform. With extensive shape libraries, data linking, and sharing capabilities, you can easily design and disseminate your ITIL processes (from strategy to operations) and ensure knowledge gets shared to the right people at the right time. Knowledge management is a big job. Use Lucidchart to get it done.